For the work-oriented buyers the focus is on the capability. With that in the mind the truck makers competes to offer the class-best torque, towing, massive equipment in different specifications and trim levels. The truck that rounds up all mentioned attributes and brings you next-level of capability over the light-duty haulers is Ram 2500. It belongs to the same three-quarter ton class with other heavy-duty models like Ford 250, Silverado 2500 HD and Sierra 2500 HD. It is available in many equipment levels and body configurations. However, if you for some reason need the best of interior space 2017 Ram 2500 Mega Cab is solution for you. The Mega Cab is four-door cab style that is larger version of mid-level crew cab version. Below these is a regular cab with two doors. The Mega Cab actually sits on the same length wheelbase as the crew cab model with longer 8 foot bed but it has bigger cab and smaller 6 foot 4 bed. The model also offers the choice between three powertrains. The next decision is for the trim level and there you can pick between Tradesman, SLT, Big Horn, Power Wagon, Laramie, Laramie Power Wagon, Laramie Longhorn, and top Limited. In terms of styling, 2017 Ram 2500 Mega Cab looks tough and capable as the true work truck. Its look is more traditional and rugged than some more modern looks from rival brands and it resists changing in that aspect. 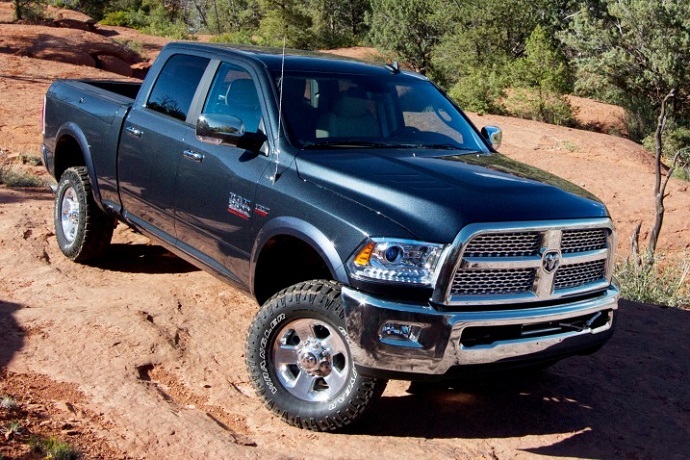 Its exterior look corresponds with the light-duty Ram 1500. Different trims add some unique details like more or less chrome and different grille and bumper colors. The most grilles use signature crosshair design but they come with different patterns. The Limited version features unique front fascia. Interior is highly functional and among the nicest in the class. On the high-dollar trims it uses soft-touch surfaces and contrasting stitching. There are also metallic accents to break one tone design while plush seats provide high comfort. Mega Cabs also expand legroom and offer reclining seatbacks. Many practical storage compartments are available in the cab as well. The model also includes an 8.4 inch Uconnect interface with logical controls and virtual buttons. The system has fast response times and supports many Smartphone apps. The offer starts with the base Tradesman model. It offers vinyl upholstery, power windows and locks, six-speaker system, power heated mirrors, etc. It rides on 17-inch wheels and has automatic headlights, black grille and bumpers. The SLT has chrome exterior elements, and 18-inch wheels. It also includes cloth upholstery, power and heated mirrors, touchscreen interface, keyless entry, satellite radio, etc. Premium cloth upholstery and leather wrapped steering wheel become available on the Big Horn models. There are also limited slip rear differential, 18-inch alloys, chrome slats grille, a ten-way power driver seat, etc. The Laramie adds leather upholstery, dual zone climate control, heated and ventilated front seats, upgraded infotainment system, a 6-way power passenger seat, etc. On the Laramie Longhorn you will also find running boards, upgraded leather upholstery, chrome mesh grille design, heated rear seats, power pedals, navigation and more. The Limited has 20-inch wheels, unique front fascia, black leather upholstery, the RamBox cargo feature and so on. The Power Wagon adds off-road styling and hardware. It has tow hooks, skied plates, electronically locking differentials, all-terrain tires and so on. The standard engine on the most trims is a 5.7 liter HEMI V-8. It produces 383 hp and torque of 400 pound-feet. In some configurations this engine allows up to 13, 900 pound of towing capacity. More power comes from the bigger 6.4 liter V-8. It is available on all trims and standard on Power Wagon. It outputs 410 hp and 429 lb-ft of torque. With up to 7, 390 pounds it is payload champ. The Ram also offers oil burner that can produce 370 hp and peak torque of 800 lb-ft. It is a 6.7 liter turbodiesel inline-six engine. It beats in towing capacity with up to 18, 000 pounds. All engines come paired with a six-speed automatic transmission. A six-speed manual is available with some diesel powered models. Rear-wheel drive is standard in the most 2017 Ram 2500 Mega Cab configurations. All wheel drive is optional and standard on Power Wagon models. The price of the 2017 Ram 2500 Mega Cab varies depending on the trim level and optional equipment. It starts form around $37, 000.